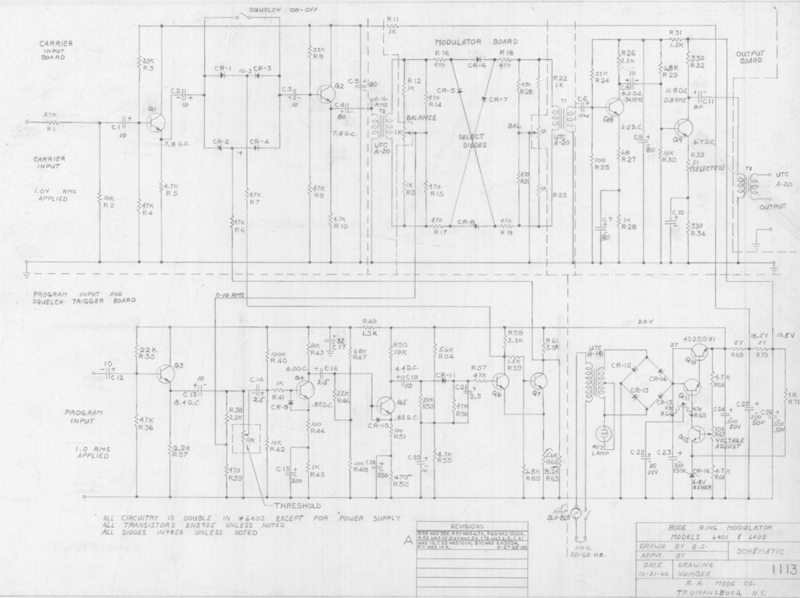 From the Bob Moog Foundation Archives, shared for our eighth anniversary on August 21, 2014: 20 original schematics, some hand-drawn by Bob himself. 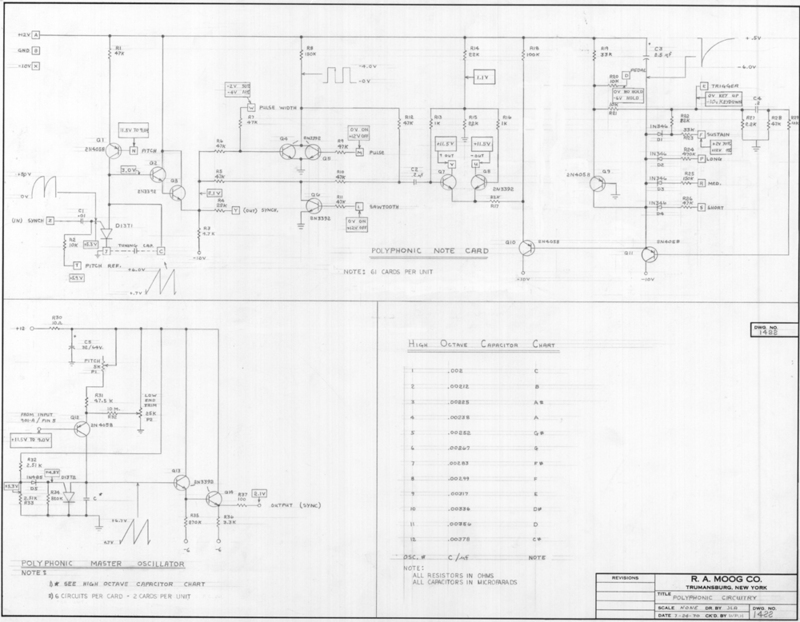 View all our schematics on our main schematics page here. As we consider the electrical engineer, it is easy to imagine the aspects of their trade. We envision soldering irons and oscilloscopes, electrical components and circuit boards, wires and tools. 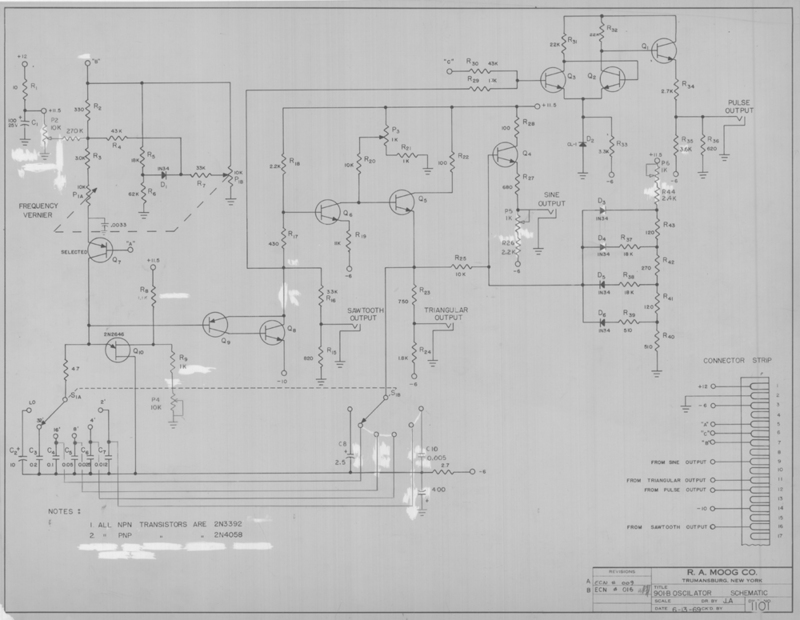 But amongst all of the practical tools of the electrical engineer, there is also an artistic tool; a tool that is as aesthetically pleasing as it is functional: the schematic. We intend to progressively post them for your examination, learning, and enjoyment. 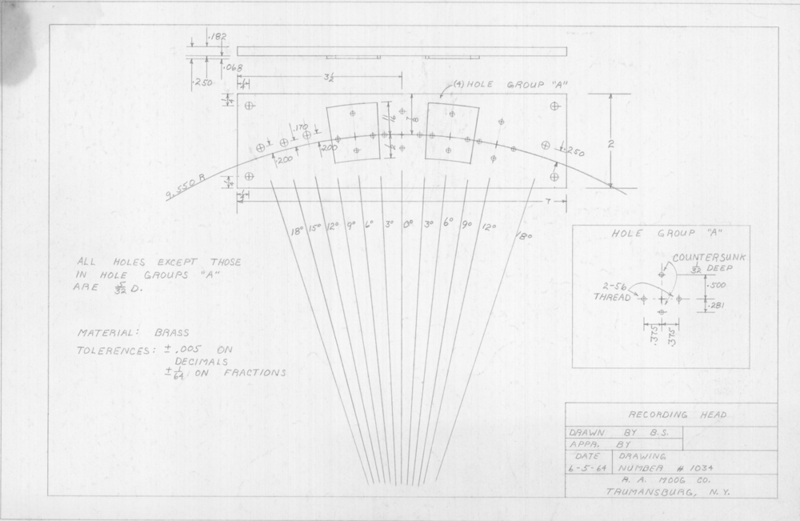 This is a technical drawing of the structure of the recording head of a tape recorder, hand-drawn by Bob Moog. This is an extremely early document, created in June of 1964. It predates even the sale of modules that would happen later in 1964. Eventually, R.A. Moog Co. would offer the creation of recording devices as one of its services. 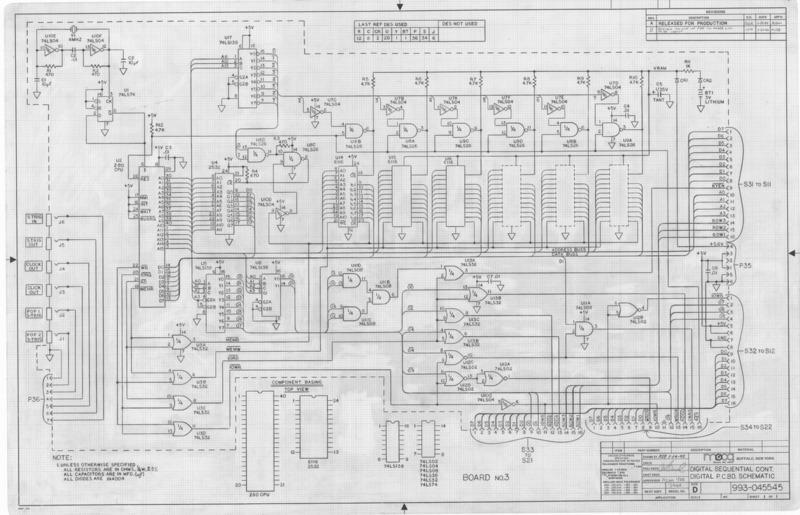 This schematic is extremely exciting. It is from 1965, when the first modules for sale were being built. In addition to its early nature, it was also hand-drawn by Bob Moog, using his initialized colloquial term, “B.S.”. 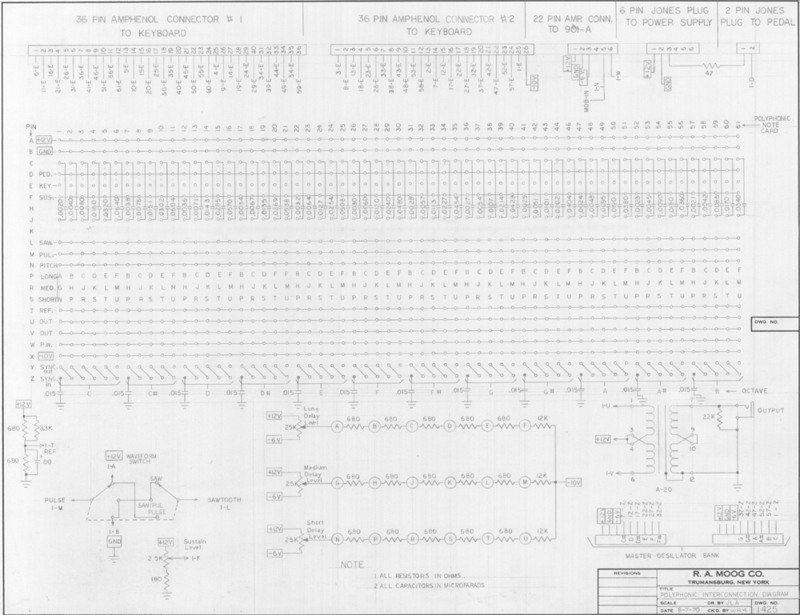 This schematic lacks the name of the draftsperson, but it appears to be the same person who drew the 1966 901-B schematic in this series. This was drawn in 1966. The 901-B oscillator is the second half of the 901-A/901-B combination. It allows you to set the octave, pitch, and waveform of the tone it generates. 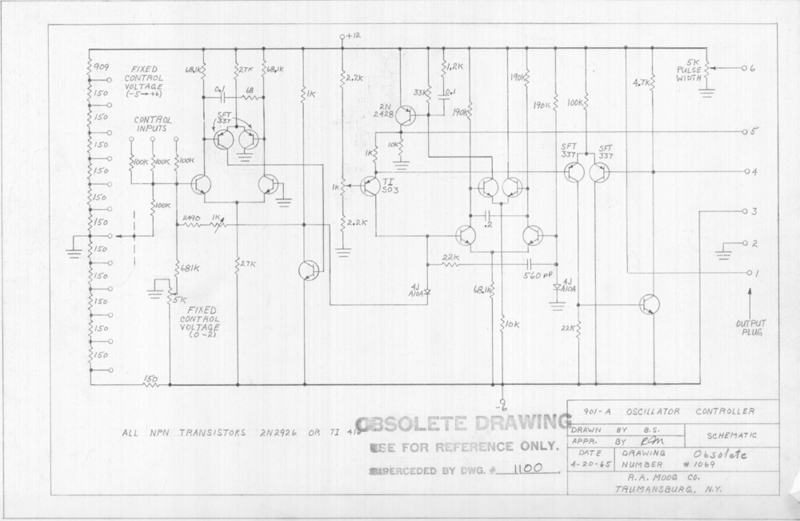 This schematic was hand-drawn in 1966. Harald Bode was a synthesizer pioneer. From his synthesizer in 1937 to his synthesizer contributions to the WDR studios in Cologne, to his groundbreaking voltage-controlled Sound Synthesizer in 1960, he was an important innovator. Bode and Moog began to work together in 1966, and this ring modulator is an indication of their partnership. 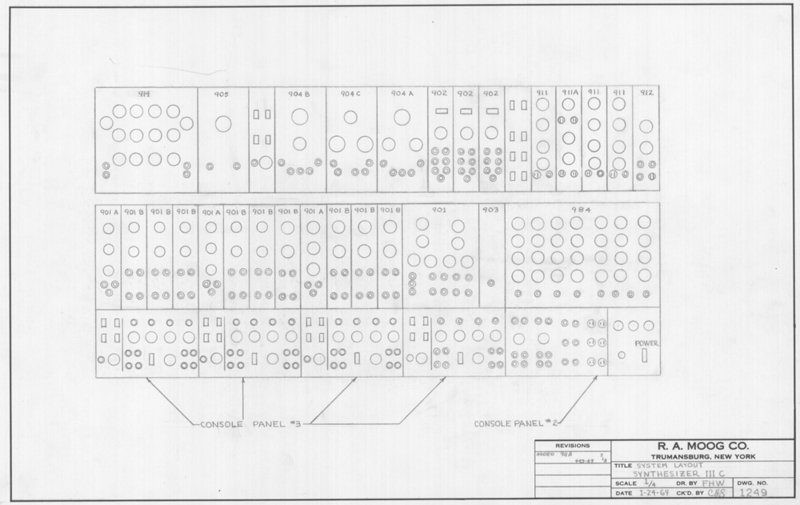 Bode’s Ring Modulator and Frequency Shifter designs were implemented in R.A. Moog products. His vocoder was the basis for the Moog Vocoder released in the 1970s. 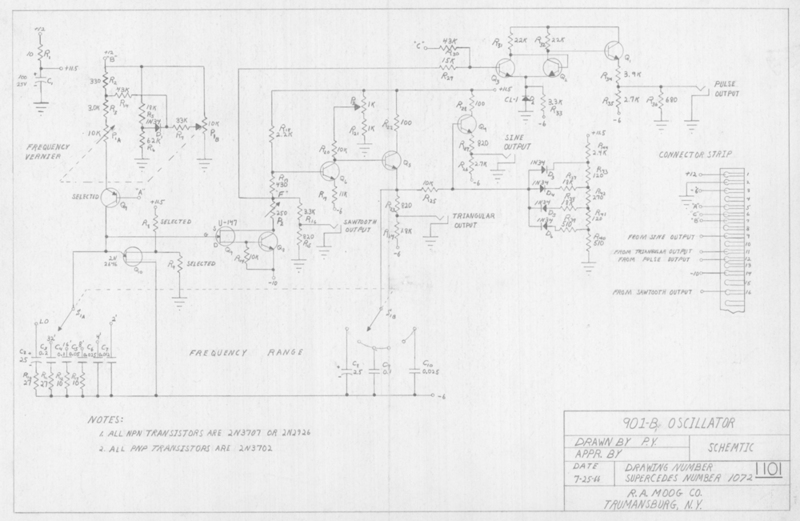 This schematic was hand-drawn by Bob Moog. Note the the “B.S.” in the “drawn by” square. 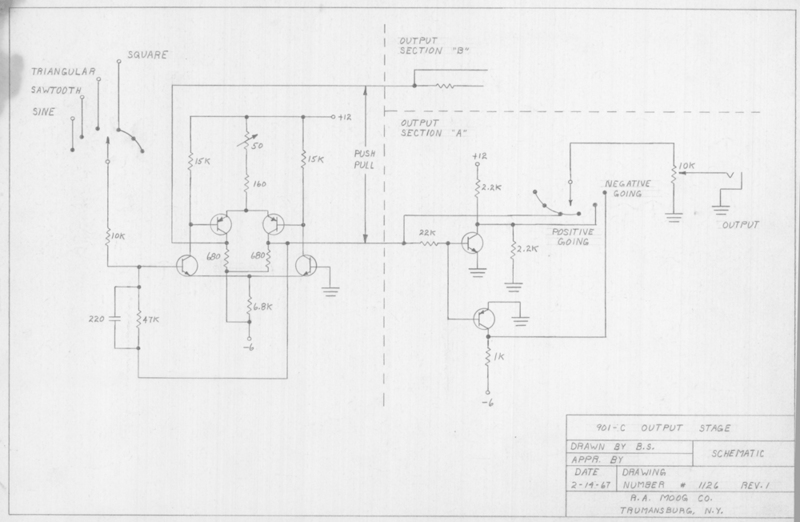 This schematic was drawn by Bob Moog in early 1967 and portrays the design of the 901-C oscillator output stage module. Note the the initials “B.S.” in the “drawn by” square. 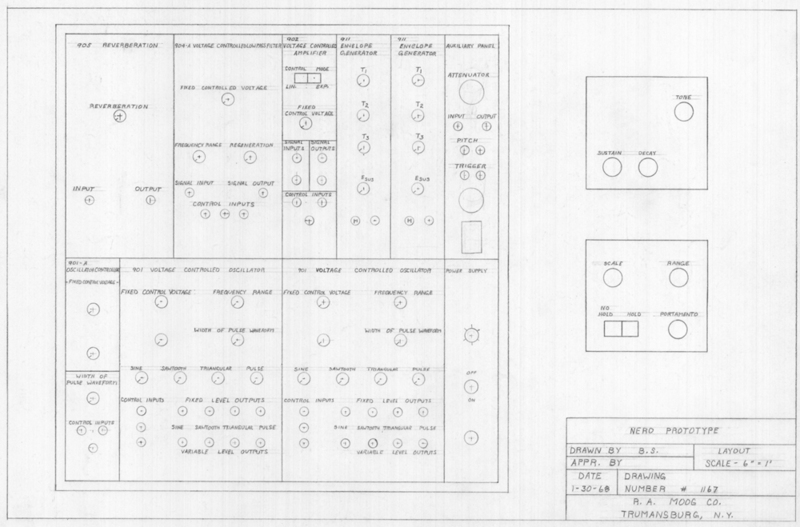 This is the layout of the Peter Nero commission synthesizer. It was drawn by Bob Moog in 1968 when Peter Nero, a famous pianist, commissioned Bob to create a synthesizer device for Nero’s use in concert. Note the the “B.S.” in the “drawn by” square. 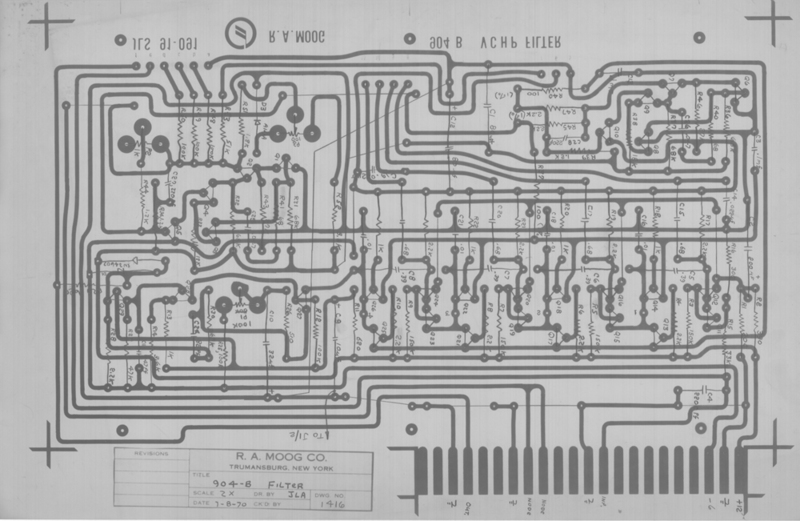 This drawing shows the modules and their layout for the Synthesizer Ic model. It was made in 1968. 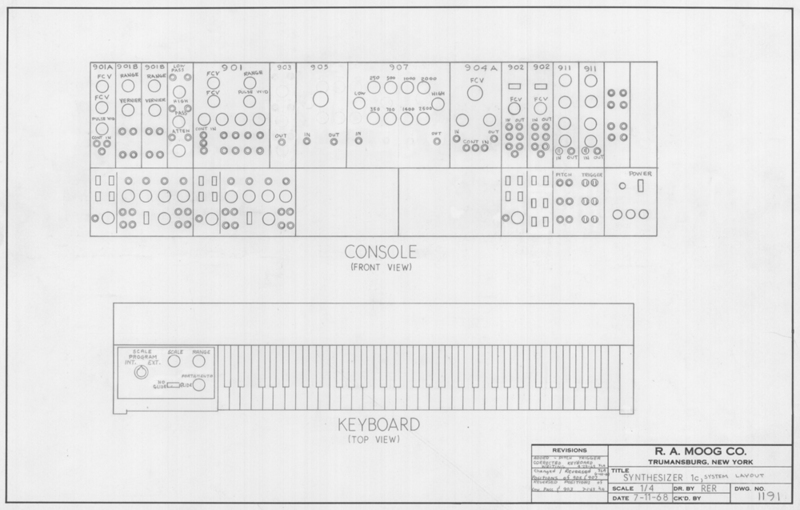 This schematic shows the modules and their layout for the Synthesizer IIIc model. It was drawn in 1969. 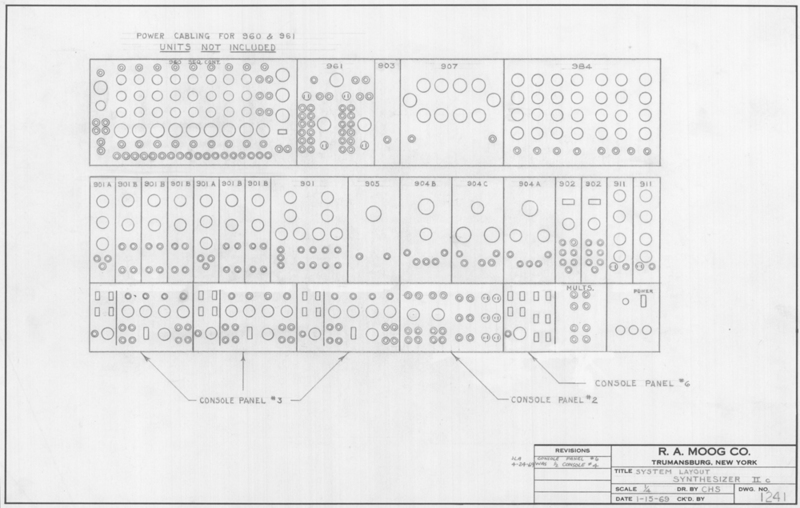 This is a 1969 schematic of the metal drilling specifications of the faceplate of the Console Panel #5 module. 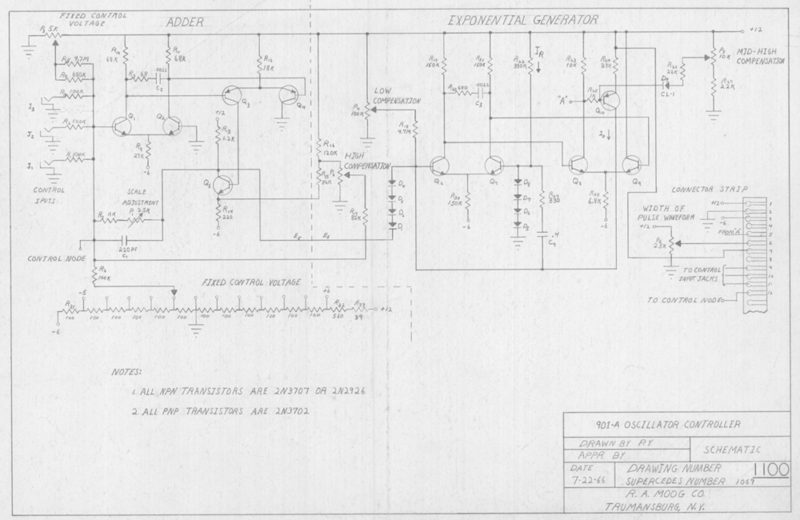 This is a 1969 revision of the schematic for the 901-B oscillator. 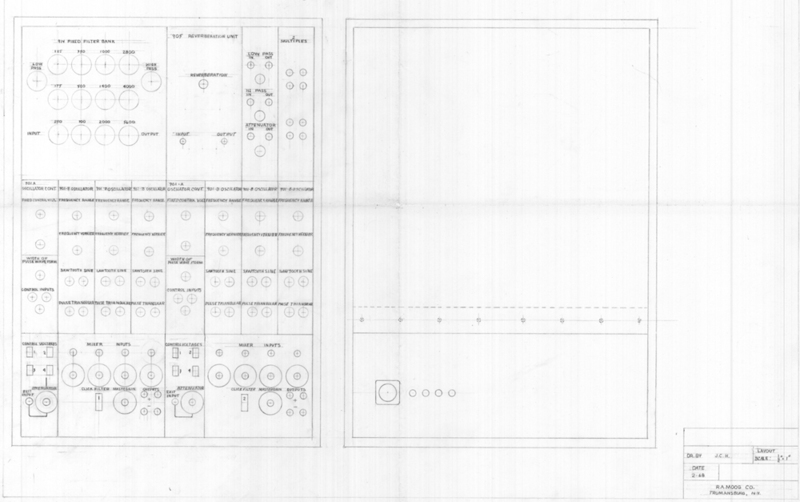 This drawing shows the modules and their layout for the Synthesizer IIc model. It was drawn in 1969. In this schematic, we can see the metal pathway that connected the components on the circuit board within the 904-B High Pass Filter module. 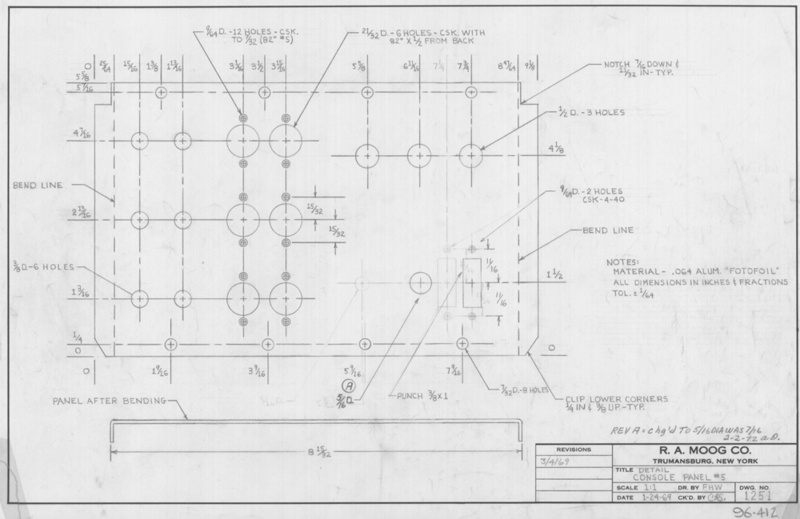 This particular schematic was made in 1970, so it must have been an update to the design that was created earlier. 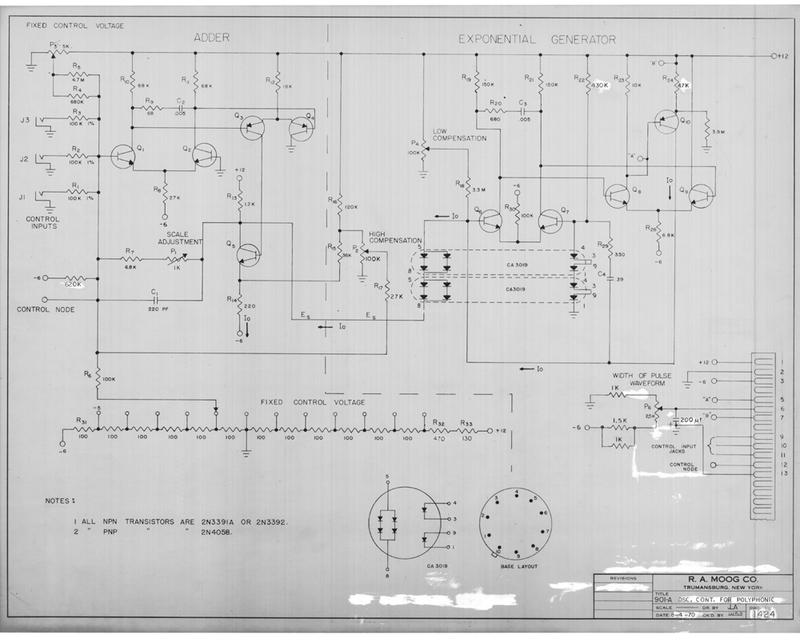 This schematic, similar to the “901-A Oscillator Controller” from 1966, is the adapted version of that oscillator for use with the Polyphonic System in 1970. In the 1930s, polyphonic synthesizer technology was invented by the Hammond company that allowed a limited number of oscillators to provide octaves of frequencies. The structure of the Moog modular was largely monophonic, which meant only one note could be played at a time. Wendy Carlos suggested to Bob that he build her a divide-down system that could be operated through her modular, allowing polyphonic performances. He did, and some version of this system was to be marketed in 1970. This schematic and several others show the architecture of this polyphonic system. Another schematic related to the Polyphonic system. We are primarily looking at a voice card which allows different waveforms for the voices of the notes. There were to be 61 individual voice cards per device. Never heard of the Moog Midget? This layout was not released under that name. This is the layout for the Realistic MG-1. 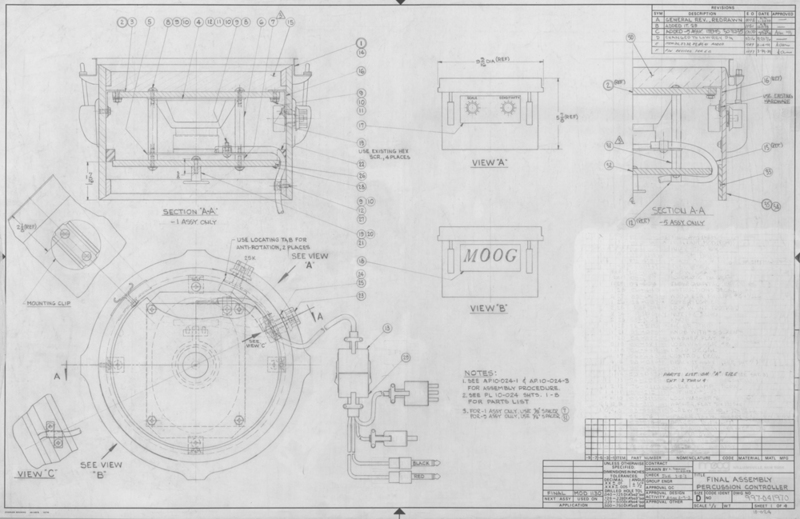 This mechanical drawing is from the 1973 Moog 1130 Percussion Controller, showing the assembly of the final unit and giving hints to its operation. The 1130 converts the physical impact of the drum head being hit into a voltage output that can be used to control any voltage-controlled aspect of a Moog modular, or any device that responds to changes in voltage. In 1982, Moog Music was working on a digital sequencer. Note the startling increase in complexity when comparing this schematic to those created in the ’60s. It also contains computer chips like the Z80 CPU. The Bob Moog Foundation possesses a prototype of this digital sequencer, which was done in the visual style of the Moog Source.